Cadbury Silk, the premium chocolate brand from Cadbury Dairy Milk had just finished with the buzz around its coffee treat for two promotions on social media, that I chanced upon something new brewing up at Cadbury Silk. I watched in eager anticipation as the chocolate brand’s social media pages piqued my curiosity with its fun teaser images and videos hashtagged #LetsPlay. I wondered what new chocolate was Silk bringing on! It has now been revealed as the new Silk Caramello with Silk outside and Caramello inside, through an exciting and fun-filled social and digital media campaign conceptualised and executed by digital agency Grey Social. Here we look at the creative content strategy behind its launch. Prior to the launch, Cadbury Silk embarked on a teaser phase with the sole objective to create intrigue and build anticipation about the ‘New’ silk which is about to be launched by leveraging its social media platforms. The Cadbury Silk Facebook page used its Cover Photo to communicate the new. A Cadbury Silk bar transformed into the new Caramello, one cube at a time. Every day the cube grew in size and eventually turned into a bar of Caramello! Simultaneously, the chocolate brand created Vine videos to depict various scenarios on what could be the reason behind the growth of the size of the new Silk cube. Building on the story with the help of Facebook and Twitter posts, the brand shared different ways to portray the new size and form of the Cadbury Silk cube. Finally, the big reveal happened on the Cover Photo of the brand’s social media pages. The new Caramello was depicted as the new Silk variant with “Silk outside. Caramello inside” with a centre-fill gooey liquid caramel. The idea of “Silk outside. Caramello inside” was further strengthened by animated flash banners which showcased the journey of the creation of the new Silk Caramello. Posts on its Facebook and Twitter pages depicted the different ways in which you can eat a Caramello and still have fun while doing it. Also, an innovative Banner was created on the MSN OTP property for a wider visibility, while a 1000×1000 ad unit was used to engage the user by giving her a virtual eating experience of the new Caramello by using face tracking technology. The banner invited users to activate their webcam; once activated using Face tracking technology the creative would detect bite-gestures the user makes and subsequently reflect chunks/bites taken off the corresponding Caramello Bar unleashing the caramel ooze at its center. Cadbury itself has so many sub-brands that a new variant in one of its sub-brands had to be given a larger than life welcome for it to be noticed. The launch of Silk Caramello seems to have been designed with the sole objective of creating a memorable differentiation using its social media properties. The playful approach of Cadbury Silk reflects on the television commercial as well as the visuals and videos shared on its Facebook and Twitter pages. It’s also been stressed upon by an apt hashtag #LetsPlay. Apart from creating awareness and buzz on the new Caramello with the help of creative content pieces, the brand has also ensured a fun engagement activity for its fans. 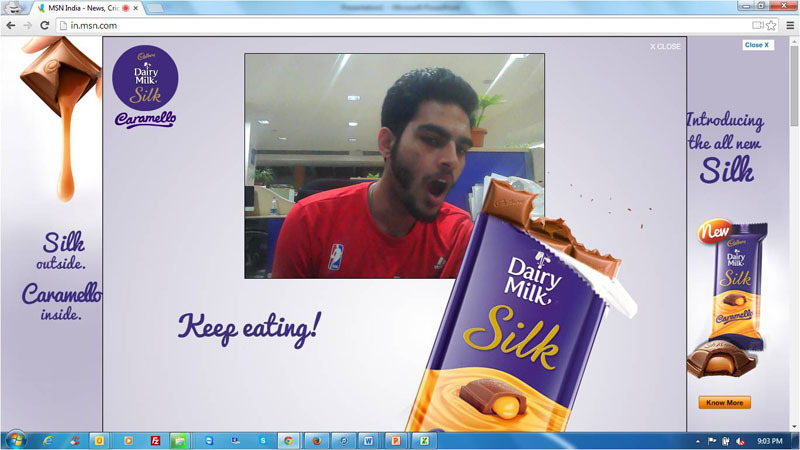 The innovative banner with its face tracking technology, gives users a virtual eat experience of the new chocolate variant with ‘Silk outside. Caramello inside’. We’ve experienced this earlier in the Pizza Hut Chomp-a-thon Facebook app where one had to chomp off a virtual pizza. The brand could follow this up with further engagement with its fans, also known as ‘Silkaholics’, by inviting them to share the fun ways in which they would indulge in a Silk Caramello. The most wacky ideas could be gratified with giant chocolate hampers! I loved the Silk Caramello launch by Cadbury, what about you?